The connection between load and injury is often a complex one. In PF findings in the literature are somewhat mixed. However, there does appear to be evidence of increased regional loading in the development of PF (Wearing et al. 2007). Studies in female runners show a link between PF and vertical loading rate during running (Pohl et al. 2009). Many running injuries are thought to occur because of an increase in running distance, especially if that change is too rapid. However, research from Nielsen et al. (2013) suggests that PF may be more likely to be associated with an increase in running pace rather than distance. So, let's try and simplify this because I want it to make sense and be useful for runners and it's quite a technical topic. Firstly consider how you train – how far you run, how fast and how frequently. Secondly think about your running gait – the technique you use when you run and how you can change this. You can often modify your training to reach a comfortable level without reaction the next day and then gradually return to normal training. However it's important to identify if training error (e.g. a rapid increase in training distance) has played a part in your injury and not simply return to the training same training structure if it's likely to result in the same problems! More information here on avoiding training error. Running gait changes should ideally be based on individual assessment rather than a one size fits all approach. However there are changes which should, in theory, reduce load that may be associated with plantar fasciopathy. Recent research from Wellenkotter et al. (2014) found that increasing cadence significantly reduced plantar loading. A 5% increase in step rate reduced loading by 2.4 – 8%. While this seems modest its effects should be considered over the duration of the run and larger changes in cadence may have more signifcant effects on load. Increasing step rate has also been found to reduce vertical loading rate (Hobara et al. 2012) which Pohl et al. (2009) found to be associated with PF. In addition increasing step rate reduces dorsiflexion at mid-stance (Lenhart et al. 2014) and initial contact (Heiderscheit et al. 2011) and increases gluteal muscle activation prior to ground contact (Chumanov et al. 2012). These changes could, theorectically, reduce load on the plantar fascia. Running with a softer, quieter footfall has also been found to reduce vertical loading rate (Crowell and Davis 2011) so may be useful in managing PF. Run with a quiet, soft footfall. If you make these changes make sure they are comfortable and don't create pain elsewhere or make running feel much harder. Ideally have your gait analysed and see what effects these changes have on how you run and how you feel. There are other factors in gait that may influence load and symptoms in PF. Pohl et al. (2009) found no evidence of increased rearfoot pronation during running in subjects with PF but did comment that changes in midfoot pronation may be relevant but weren't measured in their study. Step width has been found to influence hip adduction and rearfoot position during running and may also influence load in PF. Many of these factors interact and are influenced by strength, control and flexibility. This is what makes individual assessment so essential. It's important to note that while there is evidence that we may be able to reduce load on the plantar fascia there is no evidence to date showing that this improves pain or function in plantar fasciopathy. Plantar fasciopathy is a multi-factorial injury. While changes to training and running technique may be helpful it's important that the contributing factors for each individual are identified and addressed. Some of these factors will affect your running gait and how able you are to change it. …Sadly Plantar Fasciopathy is a condition that some still treat with a one size fits all approach. Recently a patient of mine saw a 'specialist' prior to seeing me in clinic. He was charged £200 and given a standardised sheet of calf stretches (despite having no limitation in calf flexibility). In a study of 267 patients with PF only 16% were found to have 'tight' calf muscles. The available evidence certainly doesn't support calf stretches or any other approach as a standard treatment for all! Calf stretches will play a role for some patients but treatment should be based on your needs not generic advice. Closing thoughts; changes to your training and running gait have the potential to reduce load on the plantar fascia and help symptoms. However emerging research is focussing on a progressive loading programmes for PF which may improve the fascia's capacity to manage load. Combining load modification with an increased fascial load capacity while addressing individual contributing factors may prove the most effective approach for long term treatment of PF. 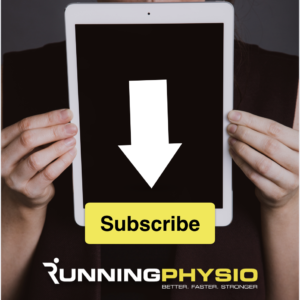 For more information see our previous articles on plantar fasciopathy and, as ever on RunningPhysio, if in doubt get checked out! Next articleKinesio Tape for ‘Shin Splints’? Interesting article. I was side-lined with PF in the middle of a race eight months ago. Just beginning to be able to train for hopefully this XC season. I’ve noticed my toes are curling compared to my non-injured foot. Is that normal?